The Rotorvox C2A – The result of four years of development and flight testing. With the Rotorvox C2A, we transfer the professionalism of the German automotive manufacturing to a gyrocopter for the first time. Created from scratch with modern methods of development and manufacturing, the Rotorvox C2A meets highest demands. Excellent flight characteristics as well as an easy and comfortable handling equally enthuse skilled pilots and newcomers. Structural stability and lightweight construction do not have to be mutually exclusive. We developed an extremely sturdy and lightweight monocoque, manufactured entirely from carbon fiber, to provide passengers with safety standards comparable to those of a Formula One race car. Traveling in a gyrocopter is now much more comfortable thanks to Rotorvox. The generous dimensions allow for a spacious cockpit, easily accommodating two passengers seated next to each other. The Rotorvox C2A provides an atmosphere you will love. Thanks to the easy entry, you comfortably take a seat. A tailor-made luggage and storage system ideally takes advantage of the space and offers sufficient storage for your travels. Quickly and safetly transport your customers to their destination. 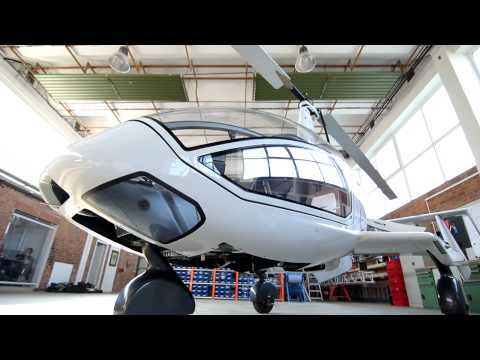 Customers will certainly enjoy the Rotorvox C2A as a most exclusive air taxi. Its high-end materials and remarkable workmanship will surely leave a lasting impression.